Russell Franks ’88 remembers the popularity. As a student at Stetson majoring in church music and voice performance, Franks was among many others who shared time and space in Presser Hall’s lone rehearsal room. There were practices and classes. And there was plenty of waiting your turn. The room of roughly 2,000 square feet was all that Stetson’s School of Music had to play with, literally. “It all happened in that room,” he recounts. Flash-forward to today, and Franks, now an accomplished singer and director, has reason to let out one of his patented operatic tones. That rehearsal space for aspiring musicians, Tinsley Rehearsal Room, has become even more versatile, more effective and more popular. Presser’s old reliable has gotten a makeover, and the enhancements are music to his ears. “It’s a much more usable space. I am viewing it as a small chamber performance venue and a very flexible space,” says Franks, now Stetson’s director of Opera Theatre. Acknowledging the previous room was a “bit tired and worn out,” School of Music Dean Thomas Masse, D.M.A., sought and received “very generous” grant funding from the Philadelphia-based Presser Foundation, a group dedicated to music education/philanthropy and the building’s namesake. Stetson and donors contributed dollars, as well. To make the renovation happen, School of Music Dean Thomas Masse, D.M.A., sought and received grant funding from the Presser Foundation. 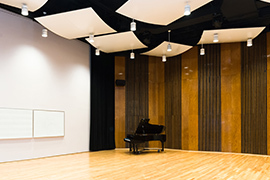 Notably, in a continuing effort to upgrade resources and facilities at the School of Music, Feasel Hall, a rehearsal hall within McMahan Hall, was added when that building came online in 2009. Masse and others, though, deemed more and better were again needed. Work began in the fall of 2015 and continued into January 2016, when renovations were temporarily halted to accommodate the room’s use. Before last fall semester began, the final touches were completed, including two new 400-pound wood doors. It was the close of one verse and the beginning of a new one. Acoustics, as one might expect, are the headliner. Two layers of insulation were added between the two-story room’s flat metal roof and a newly installed ceiling. Ceiling clouds — small panels placed high to improve aesthetics as well as reduce ambient noise in a space — were added, while a wood floor replaced linoleum tile. The new flooring consists of white oak, largely considered the standard for acoustics. Acoustical curtains offer further versatility. Lighting and technology also are noteworthy, with new theatrical lights giving students the experience of “hot lights on them and in their eyes,” Franks describes. Two cameras, a top-of-the-line projector and other video equipment deliver instant performance feedback, which can be downloaded and streamed online. Another benefit is that students can make YouTube videos and audition tapes. Acoustics, enhanced by ceiling clouds, lighting and a wood floor, are renovation highlights. “You could have a film festival in there,” says Masse, noting that the room also is available for general university meetings and students who aren’t in the School of Music. 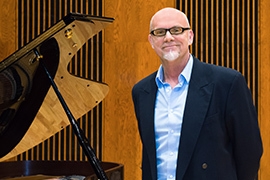 Franks, who has performed more than 1,000 concerts since his days as a student, even has plans to use the room for his own solo recital in March. He knows better than to wait too long to book it. Note: This article originally appeared in the Fall 2016 issue of Stetson University Magazine. To read the entire magazine, click here. The next issue of the magazine is scheduled for publication in February 2017.